New York has not adopted or made available a definition of college and career readiness. New York does not have state policy in place that allows students to earn dual credit (ECS, 2015). City University of New York, Middle College National Consortium, and Woodrow Wilson National Fellowship Foundation have partnered with institutions of higher education to provide 14 Early College High School programs as part of the Early College High School Initiative (ECHSI). More information about schools participating in ECHSI is available at the ECHSI website (Jobs for the Future, n.d.). New York has adopted the National Career Clusters Model and has modified the 16 Career Clusters. The modified Career Clusters are organized and incorporated into six broad “career majors” that are used for organizational purposes by the New York State Department of Education. 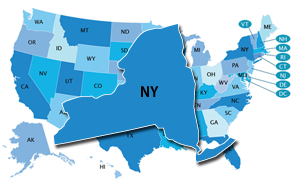 New York does not have a statewide system for career exploration or career plans at the K–12 level. New York may have a state-specific Early Warning System, but the system is not publicly available.